The Iowa Barnstormers’ triumph against the Kansas City Command Saturday night was a great example of a successful team effort, but it was also a showcase of the individual talent that collectively led both the offense and the defense to victory. 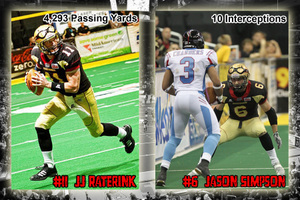 Iowa Barnstormers QB JJ Raterink and DB Jason Simpson both experienced record breaking performances on the night. Raterink finished the game completing 21-of-29 passes for 164 yards and five touchdowns. He is now within reach of breaking another franchise record for the most passing touchdowns in a single season, currently held by Aaron Garcia of the San Antonio Talons. “While breaking the record would be a good personal goal to have, it is not a focal point of the year. We are going to continue to work hard to improve as a team and establish the foundation for next year.” Raterink was recognized as the Russell Athletic Offensive Player of the Game for his performance. Jason Simpson was another productive leader on the field against the Command on Saturday. Entering the game with one record under his belt for the most kickoff return yards in a season, Simpson trailed the interception record by one. It was early in the third quarter when he collected his 9th interception, tying records with Carlos James from 2000 and teammate Cameron McGlenn from 2010. The very next Kansas City drive was when Simpson collected his 10th interception of the year, making the record his own. “It feels great to accomplish something this meaningful with the team I started with,” said Simpson, returning to the Barnstormers after playing for the Chicago Rush last year. While it has been a challenging year off the field battling injuries and working in union negotiations, Simpson believes he has given his maximum effort on the field to provide his team with a chance to be successful. “I try to take advantage of every in-game opportunity I have. It was a personal goal to get 10 interceptions for the year.” Simpson is also currently tied with Carlos James for the record of most interceptions in a game with three. “I would love to get four interceptions. I just have to make the plays when the opportunities present themselves.” Simpson was recognized as the Riddell Defensive Player of the Game for his efforts. The Barnstormers will travel to San Jose, California this week to battle the SaberCats on Saturday, July 14. Fans can watch the game aired live at Bennigan’s on 1810 Army Post Road in Des Moines as they host the final watch party of the year! Kickoff is set for 9:30pm CST.